6 nights in rooms for 2 in hotels and 1 night in a mountain gite in dormitories. Half board except on day 1. All breakfasts and 6 evening meals. Full walking notes and maps. This self-guided walking holiday is the second part of a wonderful & dramatic 415km crossing of the Pyrenees Mountain chain between the Atlantic and the Mediterranean along the GR10 long distance trail. You'll amble through stunning scenery that varies enormously, with flower filled meadows, sparkling lakes, cirques and high summits. You’ll get a taste of many different cultures, from the Basque country by the Atlantic to Catalonia by the Mediterranean. Each valley you pass through has its own distinct flavour. This section of the GR10 long distance trail starts in St Jean Pied de Port in Basque Country and then weaves its way from village to village, through the French side of the Pyrenees. It is a great opportunity to discover typical villages of the region including Esterencuby or the hamlet of Logibar and then Sainte-Engrace, the most eastern Basque mountain village. From this point on the GR10 enters typically Pyrenean, high mountain landscapes in the Bearn. In gaining altitude you will reach Saint-Martin before descending to the village of Lescun, famous for its glacial cirque. The end of this part of the long distance self-guided GR10 trail is at the village of Estaut, in the Aspe valley, gateway to the famous Pyrenees National park. 6 days independent walking moving everyday between hotels and one refuge. It is graded strenuous, although the average days include 6 - 7 hours walking and 850m of ascent & descent. The hardest day, however, includes 8 hours of walking and 1410m of ascent. Paths are generally good and well defined, although they can be rocky and mountainous in character in places. You should have a good head for heights and be able to navigate. There are two strenuous days with well over 1000m of ascent. On all but one of the other days when the ascent is less, there is over 1000m of descent in the day. Saint-Jean-Pied-de-Port is the capital of the Pays Basque region. It lies in a circle of hills at the foot of the Roncevaux pass into Spain. After checking into your hotel you may choose to do a walk in the surrounding area. A chance to discover the many delights of this beautiful region. Walk through the Irouleguy vineyards and the village of Ispoure, in the surroundings of the capital of the Basse Navarre. 8km (3hrs), +280m, -280m. The Kurutxamendi is a small hill dominating Saint-Jean-Pied-de-Port. This is a short and easy circular trail following alongside the pilgrims who go to St Jacques de Compostelle. Despite the low altitude, you will have good views of the peaks of Navarre and Labourd. 4km (1hr15), +100m, -100m. The GR10 stays in the Pays Basque for approximately 170km of walking, winding its way through tiny villages but always staying on the French side of the border. The trail heads out in an Easterly direction from St Jean towards the nearby hills. Following the deepening valley past small, isolated farms, sparkling mountain streams and steep green slopes. You get glimpses of the higher Pyrenean peaks to the East. The landscape is rural and distinctly Basque, as you pass through villages such as Caro. Your day ends at Esterencuby, where you can enjoy the local atmosphere. 12km (4hrs), +480m, -420m. In the morning, short transfer from Esterencuby to Phagalcette. A challenging but beautiful walk today. The GR10 traverses some stunning, rural countryside along cols and ridges with airy views across the beech filled valleys. There are many species of birds such as honey buzzards, black kites, red kites, cranes and storks. Herds of horses, cows and sheep graze on the hillsides. The GR10 swings up onto the flat topped Occabe before arriving in the huge majestic forest of Iraty. 20.5km (7hrs45), +1410m, -700m. Heading off from Iraty, today’s walk is mainly downhill. High mountain passes and ridges with spectacular views across the dense forest. You head towards the ridge of Ugatze at 1170m before heading towards your gite at Logibar. 17.5km (6hrs30), +360m, -1300m. Variation possible in case of bad weather, via the village of Larrau. 11km (3hrs30), +150m, -1040m. From the hamlet of Logibar, the GR10 passes the canyon of Holzarte with its famous bridge. The GR progresses in the direction of the plateau of Ardakhotchia before arriving at the ‘cayolar de Saratze’, altitude 1205m. Cayolars are the traditional shepherd’s cabins. To get to the hamlet of Senta, your walking trail takes you into the valley of Baretous. You have now left the Basque country and have entered a region called the Bearn. It is a region that functions to the rhythm of nature’s calendar and a rural pastoral life. 25.5km (8hrs), +1270m, -1050m. In the morning, short transfer from Senta to La Pierre-Saint-Martin (20mins.) (It's also possible to walk this part, adding a night in La Pierre St Martin). The GR10 makes its way to Arres de Camplong and on to the L’Anie massif. There are superb views of the Pas d’Azuns mountains in the direction of the Pic d’Anie at 2504m, one of the first really high summits in the mountain chain. The trail continues into the famous glacial cirque at Lescun. The views are superb; the summit of Camplong, the Pic Billare and the nearby plateau of Sanchese. 15.5km (6hrs30), +400m, -1150m. This is the last day’s walking for this stage of the GR10 between Saint-Jean-Pied-de-Port and Etsaut. The trail comes out of the Lescun glacial cirque and progresses towards a series of small charming mountain villages. After passing by the plateau de Lhers and the Col de Barancq, you arrive at the village of Etsaut in the famous Aspe valley. This is the gateway to the Pyrenees National Park. 16km (6hrs15) +850m, -1135m. Your self-guided walking holiday ends after breakfast. 6 nights in rooms for 2 in hotels, and 1 night in a mountain gite in a dormitory. Half board everyday except on day 1 when it's on a B&B basis. - Evening meals in hotels and gites are often local specialities, include a starter, a main course and a dessert. - Picnic lunches and drinks are not included. Picnic lunches can be ordered from your accommodation the night before. 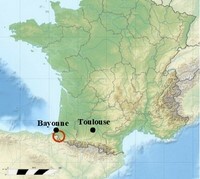 By train :TER trains to Bayonne, from main cities. Then, trains from Bayonne to Saint Jean Pied de Port. Consult the SNCF website, www.ter-sncf.com, for more information and timetables. By car : Bordeaux auto route A63, 172km ; then D918 from Bayonne to Saint-Jean-Pied-de-Port, 48km. Toulouse auto route A64, 293km, then Bayonne to Saint-Jean, 48km. Free parking in St Jean de Pied de Port at the top of the rue d’Espagne in front of the college. From Etsaut, bus to Pau via Oloron. Trains from Pau to Toulouse, Tarbes, Bordeaux and Paris. Bus from Etsaut to Oloron Ste Marie, train to Pau, another train to Bayonne and another train from Bayonne to St Jean Pied de Port. www.ter-sncf.com to consult a timetable. We recommend arriving by train to avoid returns to St Jean to recover your car, because the return journey is long by public transport and very expensive if you take a taxi. If you have to come by car, we recommend that you leave your car in Hendaye on the first day and return by public transport because you will not be tired by a week's walking.